Avid Pro Tools is a big name in Digital Audio Workstation (DAW) software, for professional film scoring and composition, and sound production for film, TV, video, and broadcast. Formerly developed by Digidesign, and now part of Avid, Pro Tools is available in a variety of versions with integrated audio interface hardware. Avid Vocal Studio with USB microphone for $99 includes the M-Audio Producer USB microphone and stand to capture vocals for songs, soundtracks, podcasts, or voice-overs. The mic includes a headphone connection for monitoring the input sound and the output from Pro Tools. Avid KeyStudio with keyboard for $129 includes the M-Audio KeyStudio 49-key, velocity-sensitive, synth-action keyboard, to play music with the included library of virtual instruments, from piano, organ, and synth, to guitars, bass, strings, and percussion. 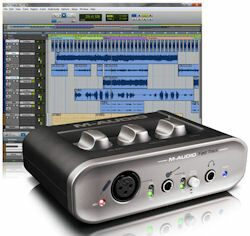 Avid Recording Studio with a USB interface box for $129 (shown here) includes the M-Audio Fast Track USB interface box, with XLR input for microphone and vocals and a 1/4 inch input jack for electric guitar, bass, and other instruments. These systems are designed for music creation and expression -- for creative hobbyists with an interest in musical composition, editing, and production. You choose the appropriate interface to record your instrument (vocal, keyboard, guitar), and then can leverage the power of the Pro Tools interface to edit and mix, compose and instrument your compositions. These Avid Studio products can get you going quickly for recording your own audio and then mixing your own musical compositions. You get both the M-Audio interface hardware and the real Pro Tools experience, so you can learn the interface as you grow. And your Pro Tools SE projects will open in the more advanced versions when you are ready to move up. It's the new year, so the International Consumer Electronics Show (CES) is back for 2011, returning to Las Vegas from Thursday January 6 through Sunday January 9, 2011. 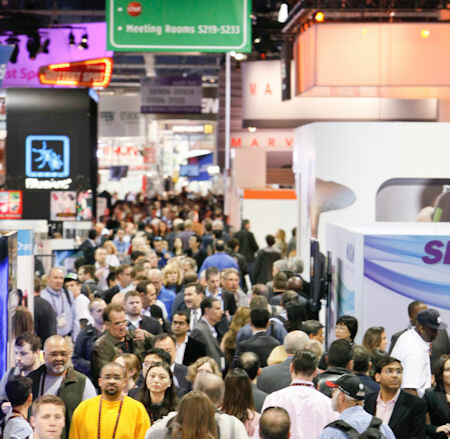 The show is produced by the Consumer Electronics Association (CEA), which reports that CES continues to be the world's largest consumer technology tradeshow, and the largest tradeshow of any kind in North America. Last year's CES had over 126,000 attendees, growing from the low of 113,000 in 2009, but not back to the peak of over 140,000 in 2007 - 2008 -- which seriously packed the facilities and transportation in Vegas. The number of exhibitors looks to be holding steady at around 2,500, with growing presence from non-U.S. companies -- all spread out over an area larger than 35 (American) football fields. There are also over 20 TechZones grouping new technology markets. The fastest growing TechZone is the iLounge Pavilion, with third-party accessories and software for the Apple iPod, iPhone, iPad and Macintosh. See my 2011 International CES Summary article for information on the show, facilities, Las Vegas, exhibits, conference program, and press events -- plus links to more information and press / blog coverage. The 2011 Consumer Electronics Show (CES) has wrapped up, with a strong upswing in attendance to an estimated 140,00 people, up from 126,000 last year and 113,000 in 2009 (see preview post). The hot topic this year, of course, was tablets, with 80-plus different products launched at the show. This is not about finding the mythical "iPad killer;" It's a fascinating proliferation of options for consumers, with different designs and target uses, including colors / textures, screen size, HD video with HDMI output, and removable batteries. This should be familiar from PCs and notebooks (vs. Macs), and smartphones and cell phones (vs. the iPhone). This CES also begins the next phase in mobile phones - from the smartphone to the "superphone" -- with 1 GHz, dual-core processors from NVIDIA, and 4G LTE mobile broadband service from Verizon Wireless, so you can engage in multi-player games on your phone, with real-time 3D graphics linked with players around the world. In the living room, CES moved beyond last year's tight focus on 3D TV to a broader emphasis on connected TV, with Internet-based services on your TV, Blu-ray Disc player, set-top boxes, and even in your car. Meanwhile, work continues on much more convenient 3D -- without glasses -- as several companies showed prototype HD displays of research in progress (albeit with very limited viewing positions). There will be some products to start trying out this year. Unfortunately, the show's size is back to the crowded conditions of 2007 - 2008, big enough to stress Las Vegas with major traffic jams getting to and from the Convention Center, and with cab lines late into the evening the first day, at the airport, Convention Center, and hotels. The Monorail also cannot handle the show-- while the trains run without human operators, they instead require a staff of ten or more people at the stations to stage and queue the passengers as they penguin-walk in crowds to funnel through a series of bottlenecks at the escalators and turnstiles. There were lots of TVs and tablets and even major appliances on display at this year's CES conference (see previous post), but the fastest-growing exhibition area was the iLounge Pavilion, with over 200 companies showing iPad, iPhone, and iPod accessories and other iStuff. The cases on display showed amazing inventiveness -- some were beautiful, or fun, or downright silly. For example, there's the Etch A Sketch Case from HeadCase, an officially licensed replica of your favorite childhood drawing pad, available for the iPad ($39) and iPhone / iPod touch ($24). It's a hard case made from impact resistant ABS plastic in that familiar shiny red. The front and back snap together. You then pry them apart with a coin (dime) using two slots on the side. The case has slots for all the switches, ports, and buttons on your device. The front is thick enough that you need to press down a bit harder to reach the bottom Home button. The back (in black) has tabs to raise the iPad for typing, and even has hole in center that displays the Apple logo, in case you're not sure what's inside the case. And no, the two white Etch A Sketch dials on the bottom are just decorative, they do not turn. 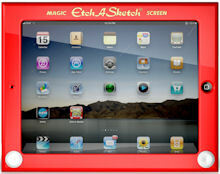 For the full Etch A Sketch experience, you also can download the official Etch A Sketch app from Freeze Tag (see the App store - basic free version, plus premium and iPad versions). It supports multi-touch so you can rotate both knobs at once to draw jagged diagonal-ish lines. And yes, you shake the iPad to erase the screen (just be real careful you don't drop it). Unlike the real thing, you even can save your wonderful drawings. There were plenty of fun and even wacky iPad cases at CES (see previous post), but there were also companies like Macally that are more focused on creating pleasant and functional designs. The Macally product line includes accessories for iPad, iPhone, iPod, and notebooks, as well as input devices, including keyboards, mice, game controllers, webcams, and USB hubs. There are a variety of covers and cases to protect your portable devices, hard and soft, clear, silicon, and chrome, as well as folder-style cases and stands. My favorite is the Macally BookStand microfiber cover and stand for the iPad, a clean and minimalist design that protects your device without adding bulk. The insides have a soft microfiber finish to shelter your precious. The iPad snaps into the stiff back at the four corners, leaving all the controls and slots fully available. 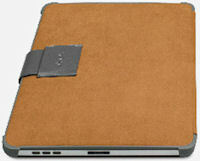 The front cover then folds over to protect the screen, with a leather slide-in tab to hold it tight. And the cover is jointed (like the Apple case) to fold back to serve as a viewing stand, held in place with the same tab. The result is clean and simple -- form-fitting protection from incidental contact, as when packed in a bag, with minimal added size or thickness or weight (it actually fits inside the Apple case). The Macally BookStand Microfiber Cover and Stand for the iPad is available for $29 (street $19), in black, gray, sand, orange, and green. Continuing on the topic of the wonderful variety of iPad cases from CES (see previous post), meet the FreeOneHand iPad Holder & Stand, a clever approach for using the iPad for extended periods. Tablets, of course, just are too big and too heavy to hold up in one hand for easy reading like a smartphone. So you end up having to shift your sitting position, or rest them awkwardly on your stomach, or hold them in two hands while trying to brace your arms. The FreeOneHand changes this completely. It clips onto the four corners of the iPad, with a two-inch pedestal in the back for holding the iPad comfortably with just one hand. For example, you can grip the post securely in your fist, or cup it in your palm in your lap, or hold it between your split fingers. As a result, you can hold the iPad comfortably for extended use, and, of course, your other hand is free for easier typing, or to reach for your coffee without having to put the iPad down. And the FreeOneHand is very useful for presentations, since again you can hold up and display your device, and even have a hand free for pointing. The base also works as an iPad stand or easel, in portrait or landscape mode. And the corner grips even extend out from the surface to protect your screen if you put the iPad face down on a table. The FreeOneHand iPad Holder & Stand is available for around $39, in ebony, ivory, silver, lime green, sky blue, and rose pink. Entries posted to Manifest Tech Blog in January 2011, listed from oldest to newest.